After much talk, I’m finally launching the Ecological Itinerary initiative, code-named Green Economy Reconnaissance Missions (GERMs). The first date is coming up soon so I’m counting on the blogosphere to spread the word fast and try to bring a good turnout. Feel free to print, post, share, link, etc. A program of group walks and excursions through geographic zones subject to ecological transformation and transition. 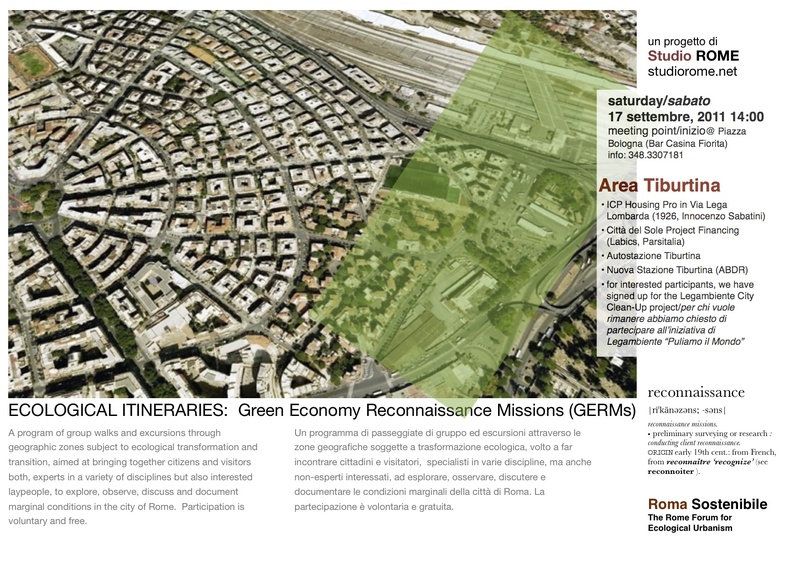 The goal is to bring together participants, citizens and visitors both, experts in a variety of disciplines but also interested laypeople, to explore, observe, discuss and document marginal conditions in the city of Rome, what Labics calls the “Borderline Metropolis” which is not necessarily at the city’s edge. Each event strives to involve key stakeholders in the area, from developers and entrepreneurs to citizen’s committees and administrators. The events are non-political and non-confrontational, as well as rigorously non-profit (with any third-party expenses being paid individually on the spot by participants). The first itineraries are being designed by architects and others at Studio Rome but once they are launched we hope that feedback by the participants will lead to their modification, improvement or even obsolescence. In the tentative calendar below we have tried to pinpoint positive initiatives, whether they be proposals for progressive developments (such as alternative energy production, transit improvements, new urban gardens, etc.) or resistance to detrimental change (opposition to environmentally un-sustainable speculative real-estate development, defense of public space, exposure of eco-abuse, etc.). We welcome suggestions and collaboration. The itineraries will be planned as “operations” with the greatest possible logistical precision, using the tools of the digital era and the advice and indications of locals, to optimize time and energy and reduce waste. Operative models might be peace-keeping missions or movie shoots, or perhaps extreme sports–anything but conventional tourism. The operations, including their planning (i.e. the email trail, including unanswered or declined requests) will be documented through video, photography and text.